If you haven't been asked this question lately, it's a certainty you will be, and soon. On virtually every marine vessel, there are opportunities to improve effi- ciency through more effective heat transfer, if you know how and where to look. Tranter's application engineers have looked for over 20 years, and have engineered a variety of solutions which have enabled ship owners, builders and ooerators to lower costs and to increase the productivity of their vessels. They've done it with plate-type heat exchangers. Our SUPERCHANGER® plate and frame heat exchangers operate at a 1-2°F temperature approach, compared with a shell and tube's 8- 10°, and with 3 to 5 times greater U values! 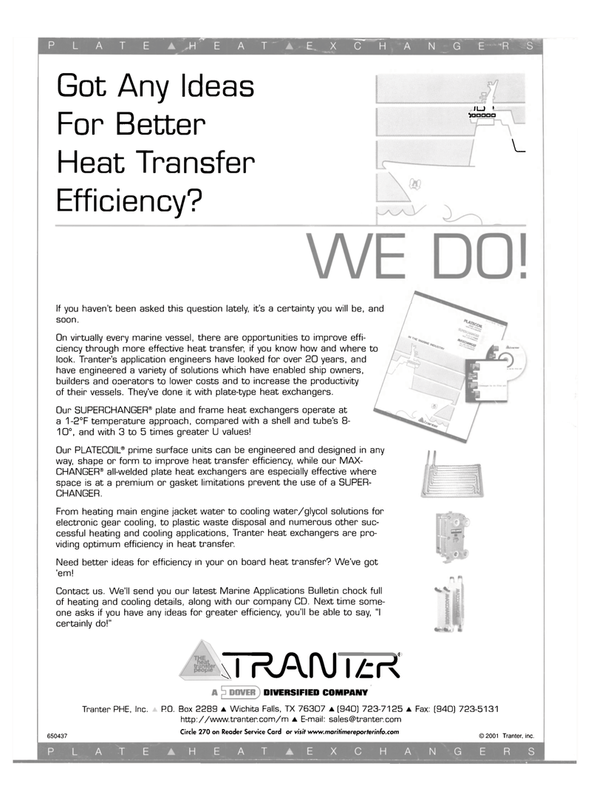 From heating main engine jacket water to cooling water/glycol solutions for electronic gear cooling, to plastic waste disposal and numerous other suc- cessful heating and cooling applications, Tranter heat exchangers are pro- viding optimum efficiency in heat transfer. Need better ideas for efficiency in your on board heat transfer? We've got 'em! Contact us. We'll send you our latest Marine Applications Bulletin chock full of heating and cooling details, along with our company CD. Next time some- one asks if you have any ideas for greater efficiency, you'll be able to say, "I certainly do!" Circle 270 on Reader Service Card or visit www.maritimereporterinfo.com © 2001 Tranter, inc.